I studied pictures of your old thread when designing mine. Those dyna trac flips are clean, but I wanted a little more holding power. 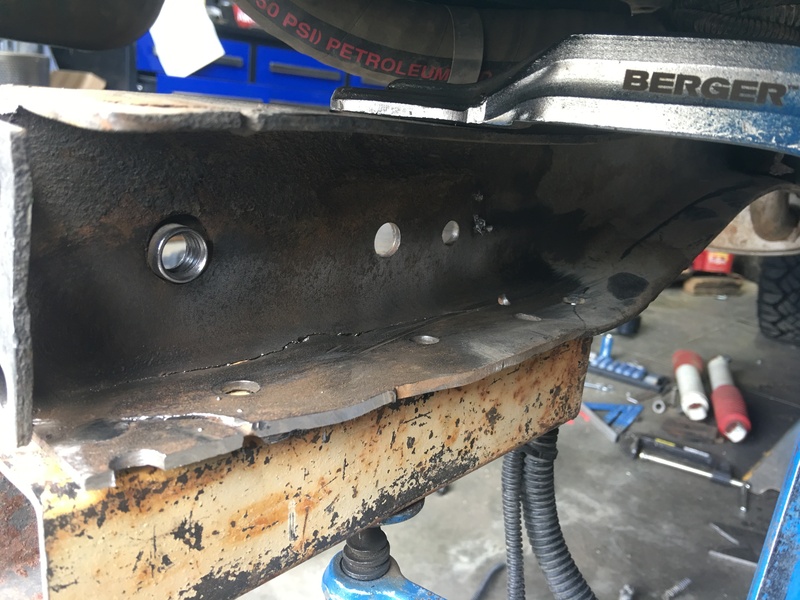 One time on a stock car, Camaro with 350hp gm crate engine, I had discovered what happens when the rear diff rotates on the springs within the U bolts. I still have to make the lower U bolt retainer plates tonight, they will look something like the ones is your pic. Are they aluminum or steel? I'm dreaming about making them out of aluminum, but the fatigue over time might kill the aluminum. There Steel.............Axle Rotate? 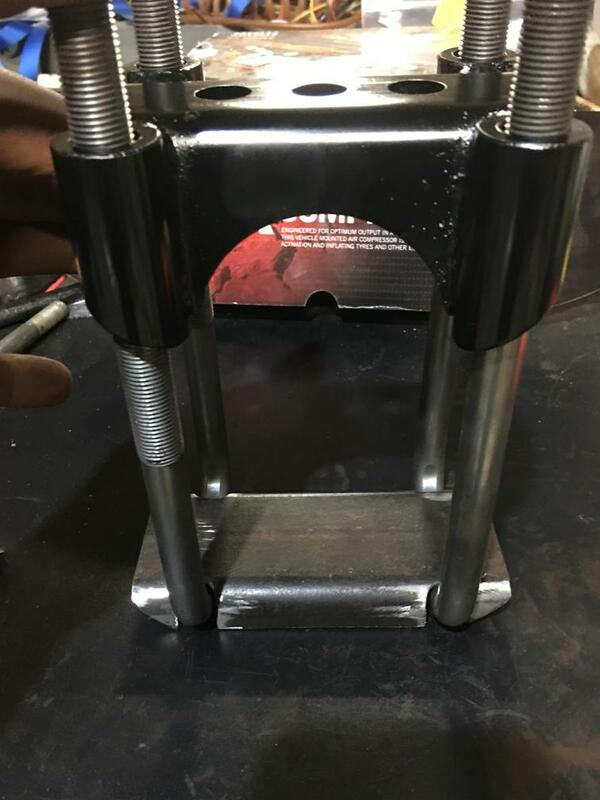 Anything is possible.........We have a standard maintenance check when it comes to U-bolts.....1) never reuse & 2) about twice a year we hit them with the 1" gun...for a few seconds , If there loose they probably stretched and need replacing.......we keep Betts Spring in business down here! This was a brand new chassis, first time on the track. Rear axle was not installed by me and the chassis builder later admitted that he only tacked the pads on while setting pinion angle. I had mountains of U bolts for this car. It was not uncommon to have them on and off 5 times in a night changing lowering block heights to adjust cross weight. I still need to box in the lower plates. These started out as some 3/16" wall 2.5" box tubing. supertrooper, Timber Cruiser, 73 cj5 and 3 others like this. Very slick! I'll have to read through your build again. Planning on SOA? The 3-holes in the perch threw me off. I was picturing adjustable.... nevermind. I see it now. Parts are beginning to pile up. I was going to make all of these brackets out of box tubing with a hole saw, but time/money/quality, I can't compete with ruff stuff. I'm planning on playing with different shackle lengths to get my desired stance. I'll make those myself. I dropped a plumb bob to mark the front spring eye location, drilled out the rivets, cut the weld and chiseled it off. 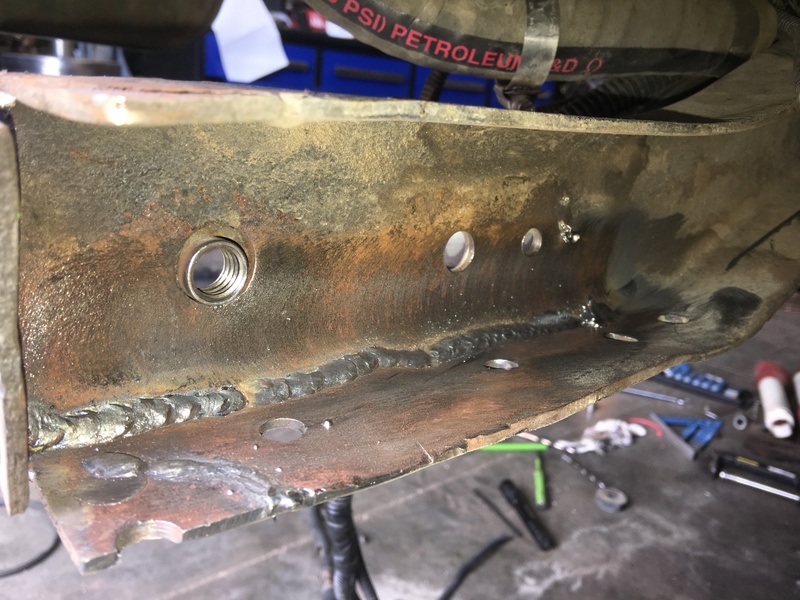 One bolt through the bracket for mock up. I drilled out the leading portion of the crack, ground it out and burned it back together. I will be boxing the rear portion of the frame before its all over with. I think that some of this recent frame cracking was due to not having a permeate rear cross member and lack of frame boxing. 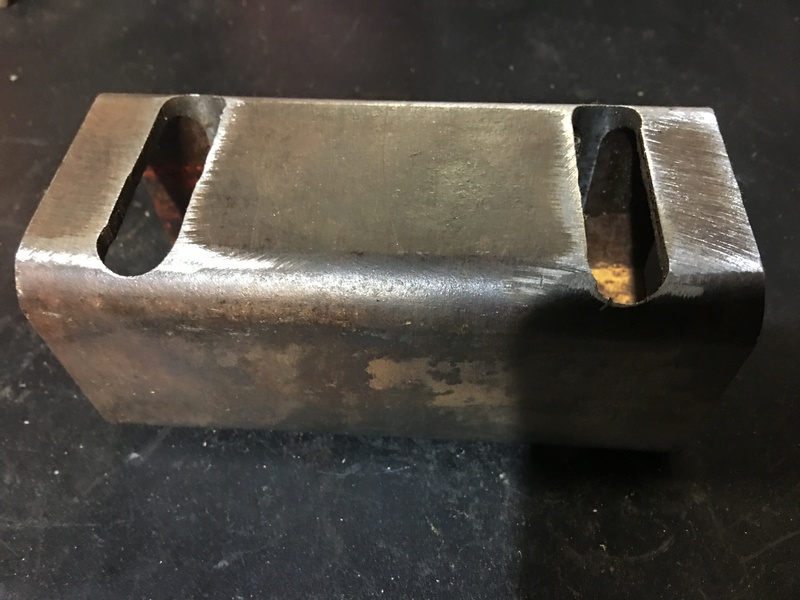 I had this piece of formed 3" channel. It was a little lighter than I was hoping for but after a little time with the dimple die it's beefy. This fits inside of my 4" C channel rear bumper/ swing out carrier. Next I will be boxing in the rear frame horns. From there the tire carrier can go back on and spring install will continue. 73 cj5, ITLKSEZ, Fly Navy and 1 other person like this. 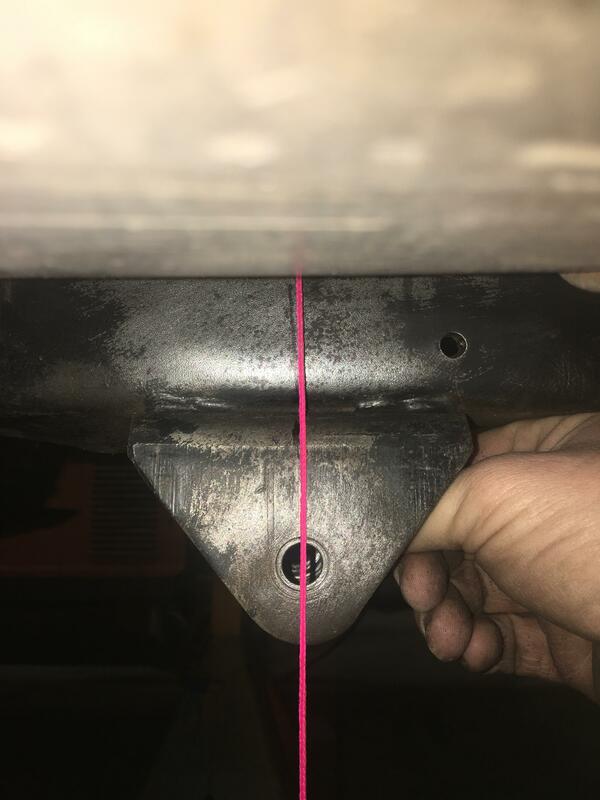 Speaking from one of those "hindsight is 20/20" moments, before you burn in the spring hangers, you might want to pull measurements (straight back and diagonally) off of the front hangers to make sure they matched from the factory, or the frame isn't tweaked at all. That's what I'm thinking. 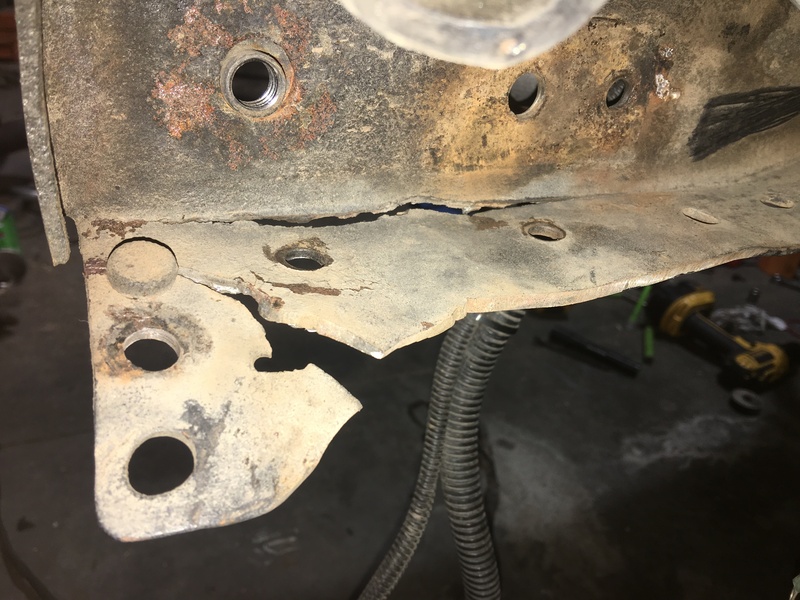 Do my best to square the two fixed leaf spring eye mounts for the rear springs to the frame and eachother. Then when I do the front, square the fixed mounts with the rear fixed mounts and let the shackle mounts fall where necessary. I'm thinking shoot for a starting angle of 10 degrees and as the springs wear the angles should improve. Can be Tough to measure and X from under the Jeep with a tape.............I find it best to find a nice , flat , level & clean piece of concrete , put it on stands or if you think the frame will flex put it on blocks under the tires and get a plumb bob and drop datum points to the floor and mark everything in chalk from the corners and start working from there...........much easier to check all the X measurements while chalked on the floor. That's my plan. I actually like to put 2" wide masking tape on the floor and then mark it out with a sharpie. On our circle track cars I have plumb bobs that thread into the ball joints on the lower a frames. 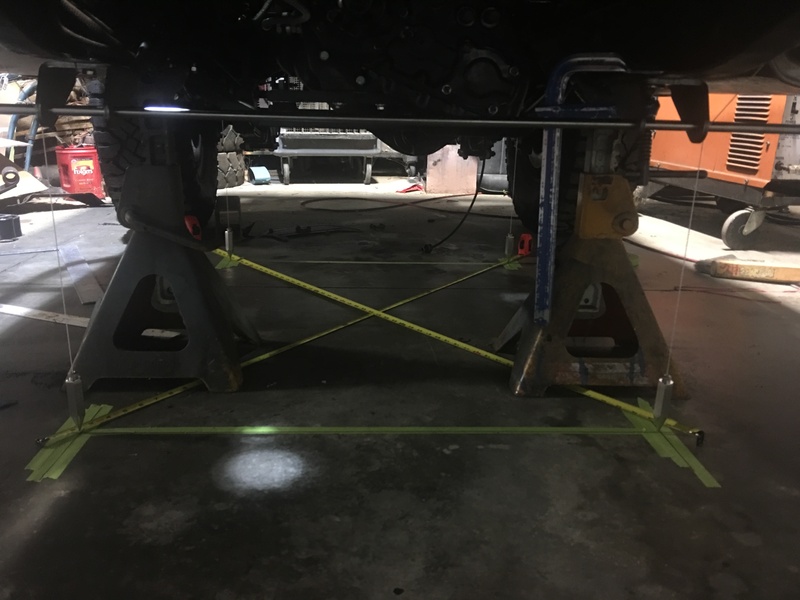 Every week the car goes on wheel stands while scaling so the rearend square can be checked and adjusted. The difference can be read on the scale in real time. I have greasable bolts for the leaf spring main eyes. I will install the bolts in the main eye brackets and then thread my grease zerk plumb bobs into them. 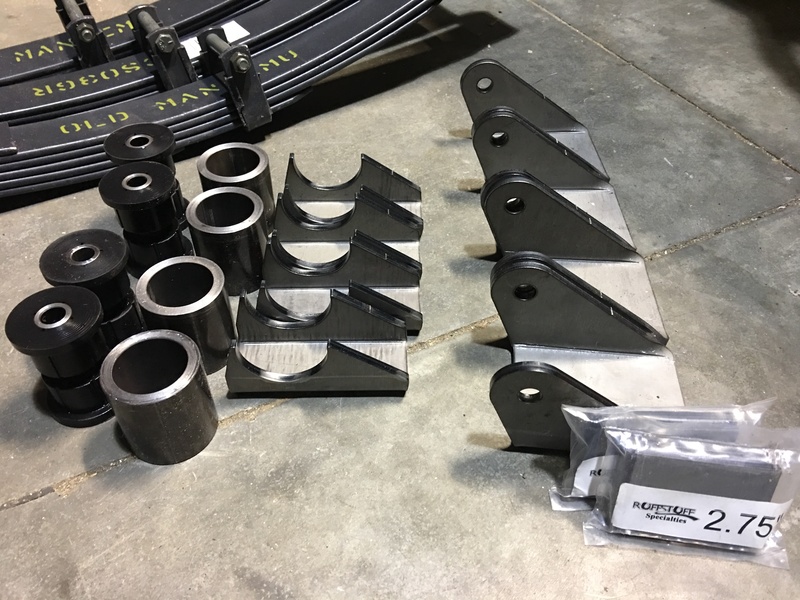 This should get me pretty close to perfect or as perfect as a leaf spring can be. Danefraz and ITLKSEZ like this. Finished up the rear cross member and frame horns last night. Now I can clean the floor, install bumper/ tire carrier and continue with the spring mounts. It's too bad that this will never be seen once the bumper is back on..... There are holes in the bottom of the frame rails to let water out. 73 cj5, jeep peep69, Dphillip and 5 others like this. Rear spring eyes are squared and tacked on. I know that this frame is not perfectly straight, but it still drove nice and straight down the road. I squared the rear main eye hangers to the front spring hangers. To start I drilled a hole in the left hand bracket and bolted it to the frame aligning the spring eye hole with the old location marked on the frame. 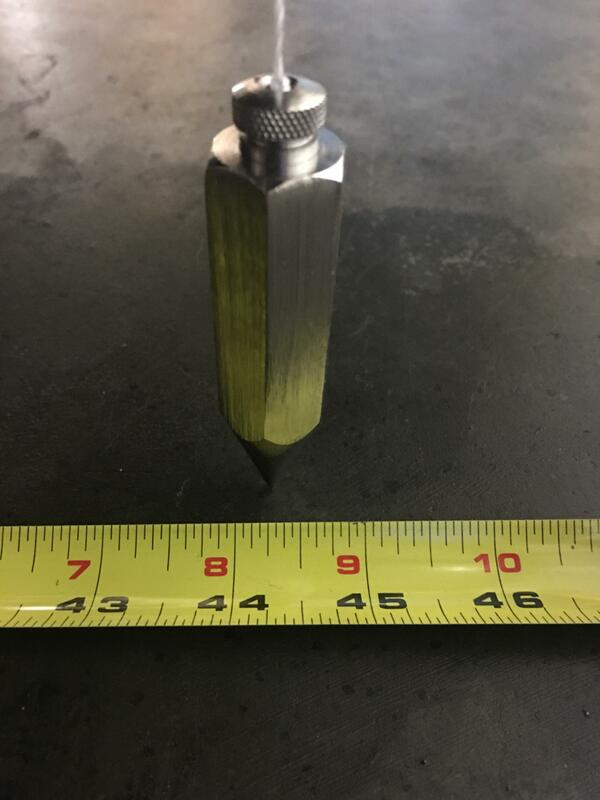 I had a 1/2" diameter precision rod (normally used for making machine pins) that was perfectly straight. I slid the right hand bracket on and clamped it. 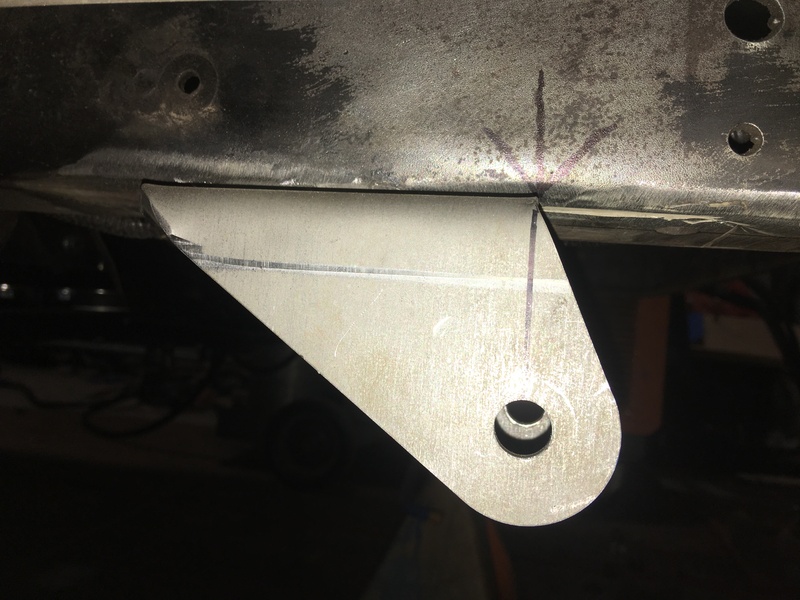 The main eye bracket holes are very tight on the rod, but with the rod through both brackets it rotates smoothly, ensuring that the two rear main eyes are perfectly aligned together. I found that this was easier to get everything lined up than using my zerk-o-bobs and greasable bolts. The picture is deceiving as it makes things look out of level. 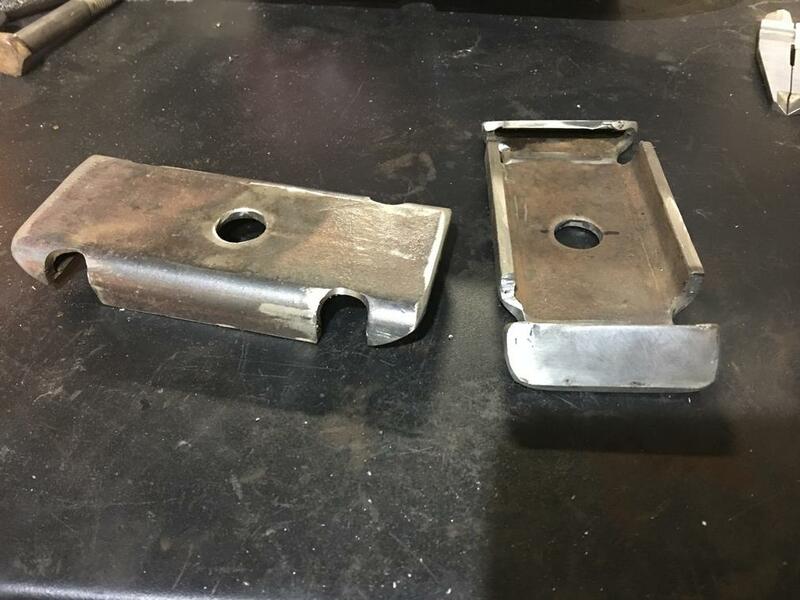 Yj Main eye brackets to frame side shackle brackets are 1125.1mm apart. 44.29 in for us normal people. I'm going to round down to 44 1/4" to make it simple. 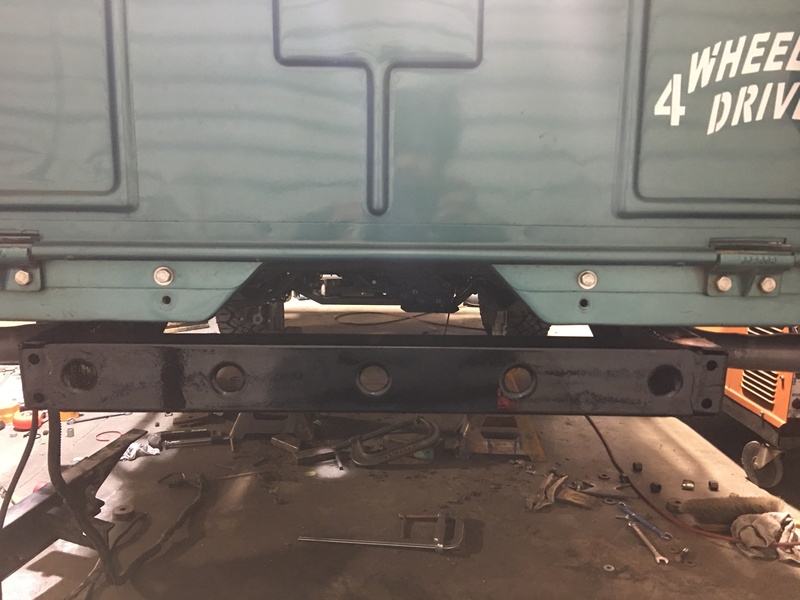 Next step will be a rod through the frame shackle mounts, then plumb bobs off the both rods to square with the main eye brackets. I always like to burn a few inches of tape measure then squaring. 47v6, Bowbender, 73 cj5 and 1 other person like this. So that's how you use a plumb correctly.....mine were crude at best with some string tied to a nail but I figure since everything is just tacked together there is room for correction. 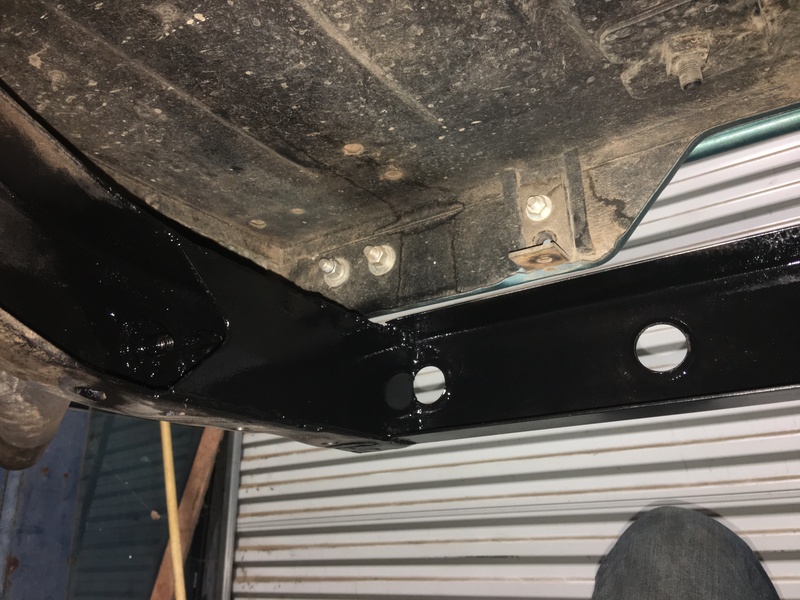 I also put my frame brackets roughly 44 1/4 apart. I just read this entire thread. You have done some very interesting mods and upgrades. You definitely have talent as a fabricator. Really nice work, and one fine looking Jeep. And congratulations on getting married. I'm only a few yrs behind. 44-1/4" than desired. I slid out my tape and dropped a plumb bob to get exactly 44-1/4". I was having a couple issues with squaring so I dropped a plumb bob off the front and rear of the passenger frame rail. 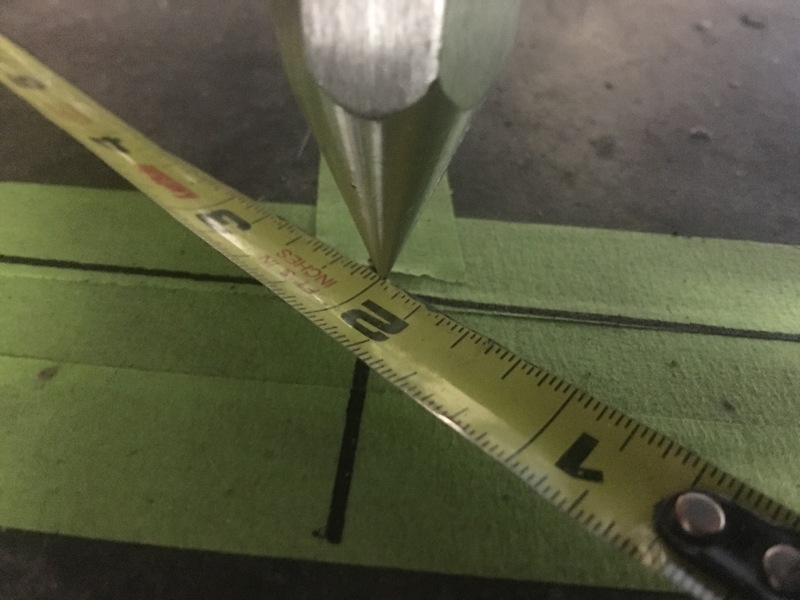 I threw some tape on the floor and with a piece of 3"x 1/4" plate drew a line front to rear. I can now drop my plumb bobs and check square with a large T square. Bowbender, ITLKSEZ and 73 cj5 like this. 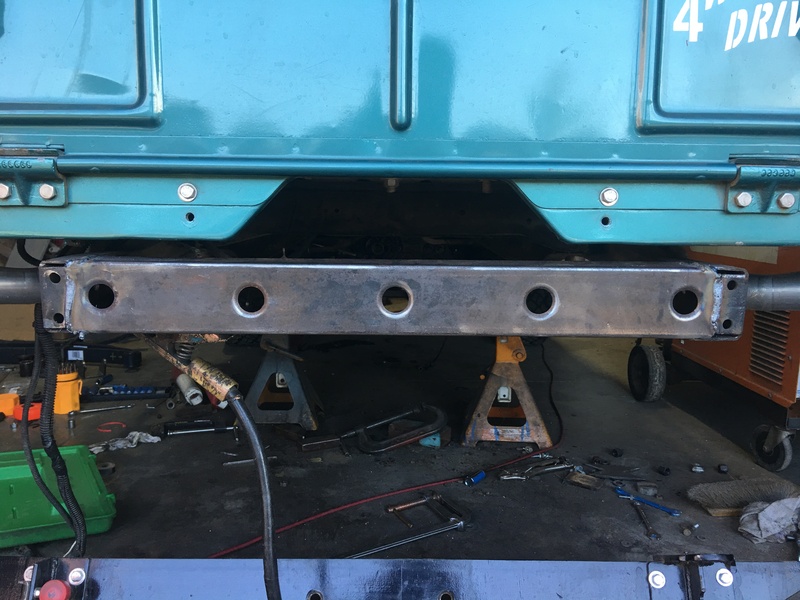 After adding the front to rear chassis line I was able to get the rear main eye mounts perfectly squared with the overall frame. From there I was able to get the rear shackle mounts clamped on and squared. Measuring diagonally they are within a 64th. Tomorrow night I will throw the axle in and make some shackles. 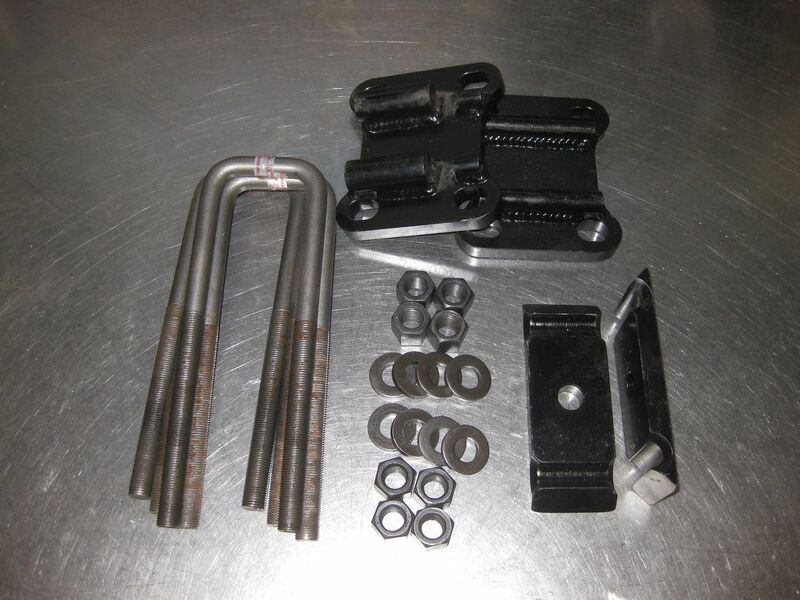 The rocky road kit uses 3.5” center length shackles. Im going to start there. 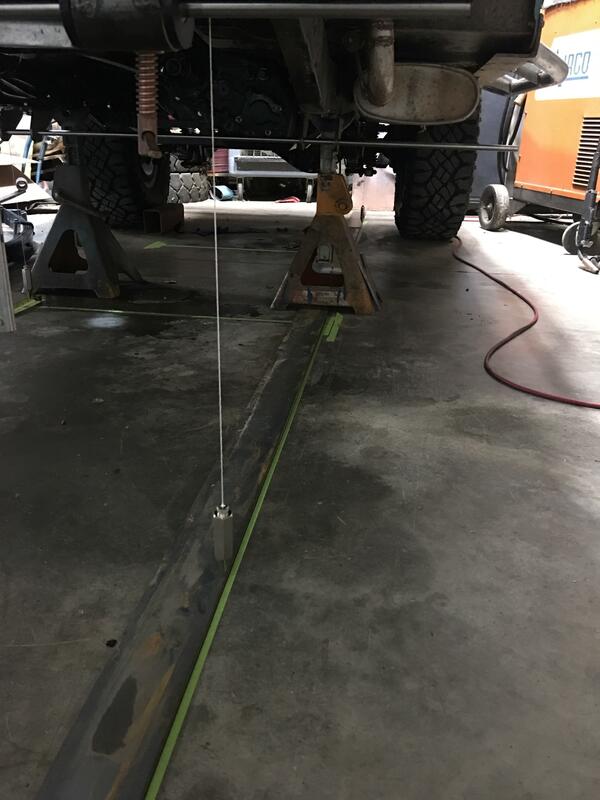 Once I’m on the yj springs all the way around I am planning on using shackle length to level the front to rear stance if necessary. dozerjim, 47v6, Bowbender and 4 others like this.